Lance Cpl. James H. Stogner was a young 18-year-old Marine ammo humper serving with a machine gun team in Vietnam. On the evening of April 5, 1967, as the sun set, Stogner and machine gunner Cpl. Eli Fobbs along with other Marines assigned to Company C, 1st Battalion, 9th Marines were tasked to push across a tree line and hedgerow towards a village suspected of hiding North Vietnamese Army, or NVA, troops. 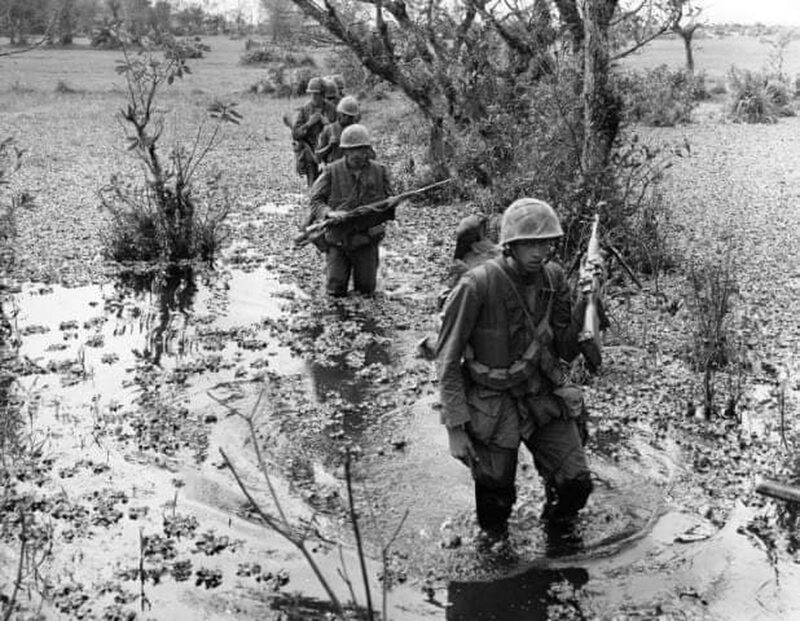 But on this mission, NVA troops were lying in wait to ambush the Marines. As darkness fell, illumination rounds lit up the night sky revealing some enemy positions, a sudden quick burst from Stogner’s rifle took out three NVA soldiers. But return fire smacked Stogner’s rifle, slamming him in the face and breaking his nose. Wounded, Stogner dropped into the prone position as grenade and mortar rounds exploded all around him. As the illumination rounds died out, much of his platoon had been killed or wounded, cut down by enemy fire. Enemy troops then pushed across the field, killing wounded Marines and taking their equipment. Stogner, armed with his Ka-Bar knife, low crawled through the dark near his wounded fellow comrades and managed to kill three NVA troops with his knife. But Fobbs, Stogner’s machine gunner, was captured and dragged into the vegetation across the NVA entrenched position. James Stogner (left) was presented the Navy Cross by Ret. Lt. Gen. Frank Libutti on April 5, 2019. Libutti was a second lieutenant when he served with Stogner during the Vietnam War. Stogner continued to crawl and moved undetected towards Fobbs’ screams, where he found four NVA soldiers kicking and abusing his comrade. Stogner killed one of the NVA troops quietly with his Ka-Bar as the enemy soldier moved towards vegetation Stogner was hiding in, and a second NVA soldier was killed in similar fashion. With two NVA soldiers remaining, Stogner stormed the position armed with his knife, thrusting it into one of the men’s chests as hand to hand combat ensued. All four NVA troops were killed as Stogner slung Fobbs over his shoulder and grabbed his M60 machine gun, carrying him to friendly lines through a hail of gunfire and grenade explosions. These are some of the details laid out in a lengthy summary of Stogner’s heroic actions, which was obtained by Marine Corps Times. For his heroism under fire, Stogner was finally awarded the Navy Cross nearly 52 years after his actions saved the life of his machine gunner and other Marines in his company. His valor that fateful night was lost for nearly a half century before he was finally awarded the nation’s second highest award for combat bravery at a ceremony Friday. The award ceremony was attended by nearly 400 people, including men who survived the ordeal with Stogner. Stogner told Marine Corps Times in an interview that he was relieved and glad that it was over. Stogner’s award, like many other veterans during the Vietnam War, was lost due to battlefield chaos and bureaucratic red tape. Shortly following his battlefield heroism, Stogner says his section team leader penned an award recommendation on a food ration box commonly carried by Marines in the field, which was forwarded to his platoon commander. But his platoon commander, soon thereafter, stepped on a land mine. Paperwork just “got lost in the shuffle,” Stogner said. Just two months later, the “entire command group was wiped out” when a rocket came through the door of the command bunker, Stogner added. Following a reunion in 2006, men who served with Stogner became aware he never received a medal for his actions and an effort was launched to recognize his valor. According to documents obtained by Marine Corps Times, Stogner was considered for the Medal of Honor but appears to have at least been partially denied because of a lack of two eyewitness statements. Many of the Marines had been killed during the battle and none appeared to have witnessed Stogner crawling through the dark of night, but neither did the enemy who Stogner made quick work of with his issued Marine knife. The sole eyewitness to the event was Fobbs. Ret. 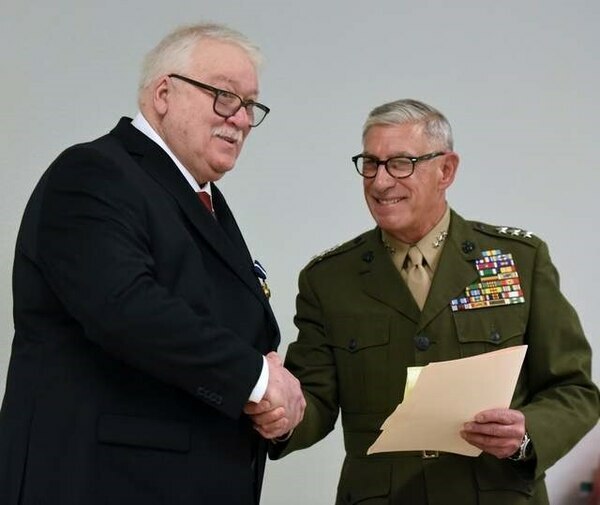 Lt. Gen. Frank Libutti, a second lieutenant at the time he served with Stogner in Vietnam, had taken the Medal of Honor recommendation to then-Commandant of the Marine Corps James Amos. An effort was made to waive the requirement for two eyewitness statements. After a nearly nine-year effort, Stogner was approved for the Navy Cross. Libutti attended the ceremony held in Montana and pinned on Stogner’s medal. About the writer: Shawn Snow is the senior reporter for Marine Corps Times and a Marine Corps veteran.